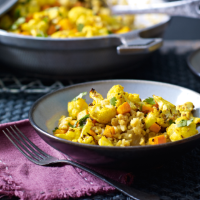 A warming autumnal dish made with roasted vegetables, spiced rice and lentils, it's also low in fat and makes a lovely vegetarian supper. until tender and golden brown. the onion for 5 minutes until softened. Stir in the curry paste, lentils and stock, bring to the boil and simmer for 10 minutes. Stir in the rice, cover and cook for a further 10–12 minutes until the rice and lentils are tender and the liquid has been absorbed. 3 Spoon the dhal pilaff into bowls and top with the roasted vegetables. Scatter over the coriander leaves and serve.